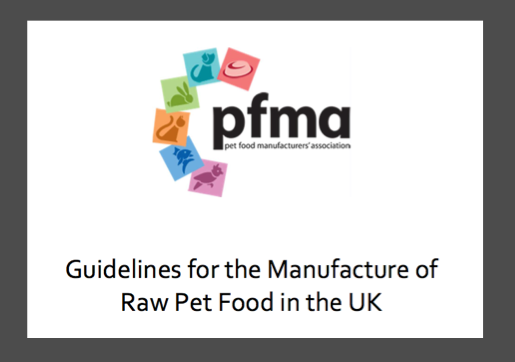 - In addition to guidelines for the manufacture of safe pet food below, PFMA has published new sector guidelines for the manufacture of commercial raw pet food. The guidelines which promote best practice in the sector have been developed in conjunction with Defra, the Animal and Plant Health Agency (APHA), Public Health England (PHE) and the Food Standards Agency (FSA). In 2001, FEDIAF (the European Pet Food Manufacturers' Association) adopted an internal set of standards, the Guide to Good Practice for the Manufacture of Safe Pet Food, which pet food manufacturers follow in order to prevent potential difficulties in the production process and to meet their commitment to nutrition, safety and quality. This code is recognised in European legislation (the 2010 update of the Guide has been validated by the EU Standing Committee (Animal Nutrition), 9 March 2010). On 8 December 2011 the FEDIAF Code of Good Labelling Practice for Pet Food was published. The Code is intended to be used as a practical guide to the labelling and marketing of pet food and should be read in conjunction with relevant EU legislation. The Code covers three basic functions of product communication; consumer information on product use, control and enforcement, retail and marketing. The Code will be reviewed at least once per annum.